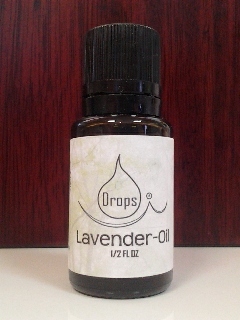 Drops Lavender Oil from www.drops-essential-oil.com and Singing Bird Inc.
Home > Drops® Essential Oils > Drops Lavender Oil, 1/2 oz. Drops® Lavender Oil, 1/2 oz. Keep Drops® Lavender Oil in your first aid kit, a must for every home. Can be used for bruises, burns, insomnia, it’s calming! Lavender is known to relieve stress, tension headaches and more! Contains 100% Pure Therapeutic Grade Lavender Essential Oil. Did I say I finally got rest? That is true the Drops Lavender Oil helps me sleep and my boyfriend as well. It does work! I've been having troubles getting to sleep at night then a friend of mine told me to try some lavender oil a couple drops on my pillow and I'm sleeping again. Thank you so much this helps my everyday life!